Part 2 in a new series of KISS action figures is on its way. Figures Toy Company is about to introduce KISS Series 2 action figures, reminiscent of the action figures first released in 1977-1978 by the Mego Toy Company. These figures will have rooted hair, cloth clothing, 16 points of articulation and are based on the KISS’ 1974 self-titled debut album. 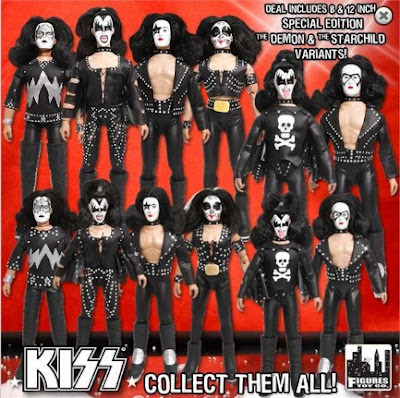 "I never understood why 8 inch KISS action figures were not produced back in the 1970's when The Mego Toy Company had already released the 12 inch versions,” says Figures Toy Company CFO Anthony Balasco. “Our second release will have the retro look from the 1970's but updated with more detailed costumes. Future releases will cover all time periods in KISS's 40 year musical career from 1972 to 2012". Look for a Demon “Hotter Than Hell” and Starchild with “Bandit Makeup” exclusives and limited edition releases. Collectors will be able to find KISS Series 2 at toy stores, comic shops, music stores and on-line retailers starting in late October. KISS are currently touring North America with opening act Motley Crue; shows wrap up September 23 in Hartford, CT. The classic rockers will also release a new album, “Monster,” in October.